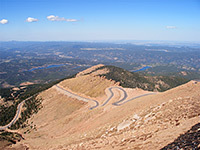 Because of its proximity to the Denver-Colorado Springs metropolitan area, the easily reached location at the very edge of the Rocky Mountains, and the paved toll road that leads all the way to the summit, 14,110 foot Pikes Peak is the most visited mountain in the USA - over half a million people make the trip each year, some via the alternative methods of hiking or riding the cog railway from Manitou Springs (now closed until 2021), but most by driving the 19 mile scenic drive (the Pikes Peak Highway), which climbs 6,650 feet to the summit. 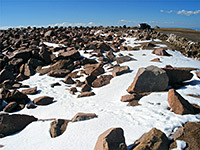 The peak allows visitors a rare opportunity to experience the tundra and Alpine scenery at this high elevation, a landscape usually only attained elsewhere in the Rockies by miles of strenuous hiking. 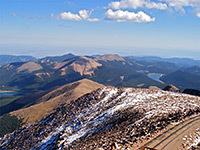 The mountain is open year round since the road is regularly plowed in winter, and although heavy snowfall sometimes blocks access for a few days, Pikes Peak receives comparatively little snow owing to the easterly location at the edge of the Front Range - most precipitation is deposited further west. The peak is visible from over 100 miles away across the flat plains of eastern Colorado, and even, on cloudless days, from places over the border in Kansas. For accommodation near Pikes Peak, the closest towns with hotels are Colorado Springs and Manitou Springs - follow the links for hotel descriptions, map and reservations. Pikes Peak dominates the Front Range near Colorado Springs, and is reached by the only road directly into the mountains - US 24, which follows the course of an ancient migration route once used by the Ute Indians, running through the deep valley of Fountain Creek. The road to the summit forks left after ten miles at the village of Cascade; it first passes houses, holiday lodges, a few rustic shops and the tacky-looking North Pole (a Christmas-oriented family theme park), before reaching the entrance station/toll booth after one mile. The cost per vehicle (2019) is $15, or $13 with a discount coupon available from the pikes-peak.com website. Opening hours vary over the year, and in general the last admission is two hours before the gate closes, with visitors required to leave the summit one hour before. Two hours is the suggested time for the 38 mile round trip, excluding stops, as the road is narrow, steep, winding, and subject to a 15 mph speed limit on some stretches. There are no more buildings past the entrance, as the surroundings become forested and the road starts climbing, quite steeply at first, past two good viewpoints of the forested Fountain Creek canyon, with the city of Colorado Springs in the distance. The gradient lessens a little as the road approaches Crystal Creek Reservoir, a sizeable artificial lake formed by an earthen dam - a popular location for fishing, and the site of one of three cafes along the road, as well as providing the first good view of the mountain, which rises above the waters to the south. Just after the dam, a side track forks right towards two other lakes, North and South Catamount Reservoir, from where several hike/bike trails begin. 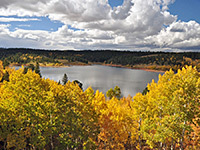 From the reservoir, the main road climbs fairly gently through scrubby, mixed forest of pine, spruce, fir and aspen up to a second picnic area near mile 10 (half way to the summit), where the surface changes to gravel and the highway begins a major ascent, gaining 1,500 feet over the next 3 miles via a number of tight switchbacks, where the speed limit is reduced to 10 mph. Trees fade away and the land is now quite bare, covered only by short grass and the occasional bush (part of the Alpine zone) so the views are rather more impressive - much of the journey so far has been through thick woodland which obscures the wider landscape. The forest returns briefly as the road enters the small settlement of Glen Cove (mile 13), which has another cafe and a gift shop, and used to be the site of Pikes Peak Ski Center, until this was closed in 1983 owing to lack of consistent snow. On the return journey, rangers at Glen Cove use a digital thermometer to check the brake temperature of all vehicles; if above 300°F drivers are required to stop for a while to let the brakes cool down. The next section is steep once more, though the climb is fairly short, as the road ascends high above the treeline into a landscape of barren reddish hills, pink granite outcrops, and very little vegetation. There are plenty of pull outs with good views, including at Bottomless Pit where the ground falls away 1,000 feet almost vertically down. Patches of snow are likely to remain in sheltered places hereabouts even in late summer. 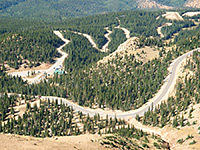 The last few miles of the road are quite straight and relatively level, so vehicles can reach speeds of 40 mph or so, though the route becomes steep and bendy again for the final ascent to the peak, and ends at a muddy parking area next to a low-set building containing another gift shop & cafe (Summit House). A few other structures are built on the hilltop, including several transmitters and the terminus of the Manitou Springs cog railway. Views from the top are of course very good but as the summit is quite flat there is no 360° panorama from any one point - to see the surroundings in full requires walking all around the edge of the summit, a hike of ten minutes or so. In most directions the land slopes quite steeply down so the views are generally of hazy, distant land far below rather than the nearby mountain sides. The weather at the summit is usually windy and cold, with the temperature rarely rising much above 40°F in summer, and often dropping below 0°F in winter. A more expensive ($40 per adult in 2018) but also more exciting way to arrive at the summit of Pikes Peak is by a 90 minute ride on the 9 mile cog railway that starts in Manitou Springs and ascends the eastern flank of the mountain. 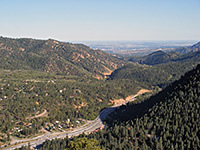 The lower few miles run along a wooded ravine (Ruxton Creek) while climbing fairly gently, then the gradient steepens markedly as the track curves around the slopes of 12,617 foot Sachett Mountain, passes above the treeline and follows a ridge northwards to Pikes Peak. Guests typically have around half an hour on the summit before having to leave for the return journey. However, following the regular winter 2018 closure, both the trains and much of the track were found to require replacement, and the railway is now closed until spring 2021. In 1921 two members of the Barr family completed several years of improvements to an old trail up the east side of the peak, a route later named the Barr Trail, and which now provides the main way for hikers to reach the summit. Like the railway, this begins in Manitou Springs, and it is also open to cycles. The path is 13 miles long and gains 7,510 feet in height, so a one-way climb is quite possible for strong hikers in one day, though Barr Camp at 10,200 feet provides overnight accommodation for those making the trip over two or more days. The trail has no particularly steep parts but the climb is long and continuous. The mountain is named after Zebulon Pike, an army lieutenant, who led one of the first recorded attempts to climb to the summit, as part of an 1806 expedition to explore the new lands acquired as a result of the Louisiana Purchase in 1803. He gave up when still 4,000 feet below the top because of unusually deep snowdrifts. The first known successful climb was by naturalist Edwin James some 14 years later, and the name Pikes Peak became officially adopted in 1840. The present day road up the north face of the peak was constructed as a horse/carriage trail between 1886 and 1888, though the route was greatly improved 30 years later and made suitable for vehicles. The cog railway opened in 1891.